After analysing first-season viewing data on more than 100 shows in 190 countries for a period of seven months, Netflix doesn’t just know that binge-watching exists — it knows exactly what it looks like. It knows, for instance, which 13 shows you’re likely to binge-watch the fastest and which ones you’ll binge on the most. By combing through the data, Netflix also determined which shows and genres are most likely to elicit binge-watching behaviour. 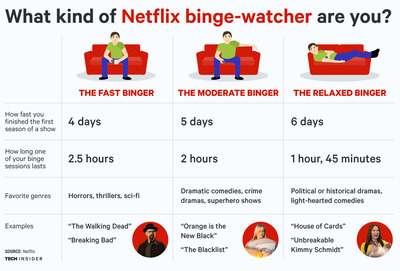 They delineated the programs along a spectrum called “The Netflix binge scale.” At one end are the “Shows to Savour.” At the other end are “Shows to Devour.” Thrills and horror shows get gobbled up in a matter of days, as viewers sit rapt on the edge or their seat (or tucked safely under a blanket). Irreverent comedies and political dramas are more thought-provoking, prompting viewers to reflect between episodes. Depending on your tastes, you probably fit one of three profiles outlined by the binge scale. 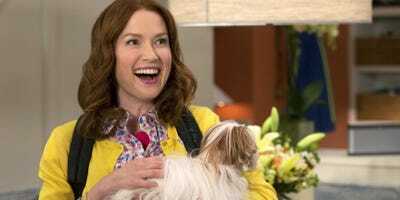 Because Netflix releases new seasons of its original shows all at once, spurred by research that finds people prefer to watch episodes in batches, the company is in a better position to analyse this kind of data than any cable providers. As a result, it can measure with stunning precision what kinds of shows compel people to keep pressing “Next Episode.” Then it can tailor future programming to those tastes, ensuring your binge-watching habits continue.